This week, I’ve got a standing desk review for you guys that I think you’ll really enjoy. This blog post is all about the Jarvis Sit / Stand Desk, a very snazzy, very popular model from the folks over at the Ergo Depot. You guys know how these reviews work by now, so enough chitchat – let’s get down to business! Jarvis, like Jeeves or Woodhouse or Chottlesworth, just seems to roll off the tongue as one of the traditional “butler names”. You only wind up with a name like that if you’re the sort of fellow who can do it all (and in style, I might add). It’s no surprise, then, that this sit / stand desk should be called Jarvis. While it certainly has its drawbacks, they tend to be things that arise naturally from the desk’s overall function and feature set. For example, the frame and top materials used in construction are super solid, but that means the desk is heavy and hard to move from place to place. Users will hardly notice little quirks like these when they start using their own Jarvis, though. Desks with so many features and options, all of which have been purpose built to suit the user rather than the other way around, are a very rare thing these days. A U.S.-based company like Ergo Depot that allows prospective buyers to come in for a studio tour and kick the tires, as it were, is still rarer! In terms of what you’re actually getting, the Jarvis experience is somewhat equivalent to buying an Apple device. There are only so many things you can do to a computer, but quality and attention to detail show. So it is with standing desks, and the Jarvis has that in spades. Not only does Ergo Depot offer a stunning variety of options on just about every component of this desk (twelve choices of top finish alone! ), but you can also request your own custom work be done on the unit, which they’ll happily incorporate as long as model / engineering specifications permit (hint: lots of people use this option for the insertion of custom desk / table tops). Additionally, your standing desk will do whatever job you ask of it – this Jarvis unit has one of the best adjustment ranges on the market, and with a lifting capacity of three-hundred fifty pounds, you’ll be hard pressed to overburden it. Finally, all the standard customer perks are there: You get a great warranty, awesome service if you have questions, and of course, free shipping on your new desk and/or desk accessories! Speaking of which, the Jarvis comes with a wide array of optional accessories. You certainly don’t need to buy them, but you should definitely check them out, as many of them make life in a busy office that much easier, and hey, isn’t that the point of a desk like this? One final note before we get into the pros and cons: If you have a custom table / desk top that you want to add yourself, you can buy the frame as an individual item. Another popular choice is using this frame with the Grizzly Maple top. Because the frame is such a beast, it can easily push the weight of the top, creating a beautiful adjustable height standing desk. Now then, let’s break things down a little more, shall we? The Jarvis is almost infinitely configurable by the user. The Jarvis is height-adjustable from just over two feet (twenty-five and a half inches) to just over four feet (fifty-five inches), making it ideal for users from five to seven feet tall regardless of seated or standing workflow. The Jarvis can support weights of up to 350 lbs. The Jarvis has a fantastic warranty – seven years on everything! The Ergo Depot is a U.S.-based company, which should sit well with the “Buy American!” crowd and those averse to dealing with far-flung, often Byzantine customer support crews. The Jarvis looks magnificent in nearly every conceivable setting! Alas, every tool and technology has its hiccups and hindrances, and the Jarvis isn’t immune. You can get a feel for its negative attributes by checking the list below. The primary blemish for most people is going to be the price. You’re paying for quality, but unless you’ve got deep pockets, it’s quite a hefty burden. This desk allows the addition of a ton of great accessories – cable management tools, floor mats, a swanky ergonomic chair, the works. The only problem is that they’re all optional and they’re almost all very expensive. The chair, for example, will set you back another $500 USD. The Jarvis is a beast to move around – solidity and features come at a cost, and in this case, the currency is the footprint of the desk. When extended to its maximum height, the Jarvis can feel a bit wobbly. 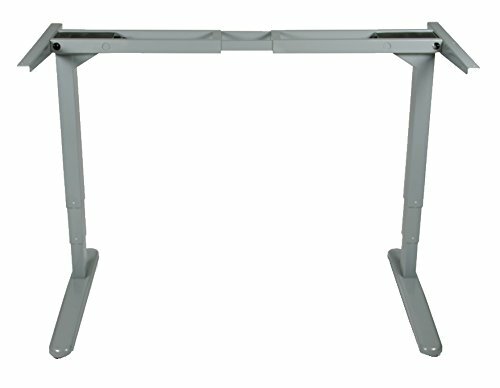 The Jarvis Sit / Stand Desk from the Ergo Depot is a great product for anyone looking into entering the world of standing desks, especially if you happen to be in the corporate or studio setting.